Luton Town’s push for promotion was a huge incentive behind skipper Scott Cuthbert’s eagerness to prolong his stay at Kenilworth Road last week. The club captain penned a new one year’s extension to his contract last week after completing 50 league starts for the Hatters. I fully expect us to be up there challenging towards the end of the season and hopefully to be a League One club next season. Cuthbert, who will now remain with Luton until the summer of 2018, believes that he should be leading out the side as a League One outfit long before then. 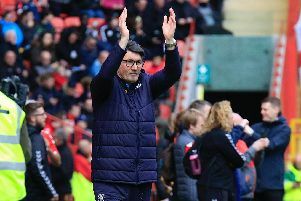 He said: “It’s nice to have another year and I fully expect us to be up there challenging towards the end of the season and hopefully to be a League One club next season. “So that’s a massive incentive for me as a player, so I’m really looking forward to it. “You sign your contract and you trust your agent to look after that kind of side if things. “It wasn’t something that I focused on and put pressure on myself to get to that, if it was going to happen it was going to happen. “I’m happy that it has and more than happy to stay here and be part of this squad going forward. Boss Nathan Jones was always eager to have his captain on board for another new, saying: “We knew that when he got to 50 he would get renewed because of a clause in his contract, and he wouldn’t have been in the side if he wasn’t doing well enough, so he’s got to those quite quickly. “He’s been a leader for us. He’s our captain. We’ve bought in captain material and still kept Scott, so he’s important for us and done very, very well this season. Cuthbert believes that Town’s performance in the division this term, particularly against the top sides, shows that going up automatically is well within their capabilities. He continued: “We’re pleased at how we’ve done, especially against the teams who are up there towards the top end of the league. Meanwhile, Cuthbert confirmed he shaes boss Nathan Jones’ claims that the squad are in ideal shape for a strong second half to the campaign. He added: “Yes, I agree, we’re a fit bunch, a strong, competitive squad. “You can see certain people’s performances, how strong we’re getting. “Look at Isaac Vassell. He’s not had a slow start, but been on the periphery, then the last month he’s been absolutely excellent in training and games. To do that though, Cuthbert knows Luton need to improve their record at home, adding: “There’s been a few too many draws in there for our liking.